Fifth-and-a-half Republic is a blog about contemporary French politics by Paul Smith, Associate Professor in French at the University of Nottingham. I know it’s been a while, but I’ll plead the headaches. Events at Lille over the weekend of 10-11 March have, however, given me both a theme and a flow. So, the weekend marked the Front National’s congrès de refondation, the culmination of (it says here) a period of reflection on the 2017 presidential and legislative campaigns, a broad and deep consultation of the membership on a range of issues the leadership deem central to the party and, as the principal tease, the promise of a change of name for the party. To recap briefly: Marine Le Pen expected to go through to the 2017 presidential election run-off in first place. She finished second, behind Emmanuel macron and not very far ahead of François Fillon. Then, she expected to get 40% of the vote in the second round, but after a poor inter-round campaign and a disastrous head-to-head debate with Macron, she took just 34%. In the general election that followed, the party took just eight seats, and even one of them has defected since. In any other party, Le Pen would be toast, but populist far-right parties don’t behave like mainstream parties and this one is built around a dynasty. Instead, Le Pen jettisoned her main strategist, Florian Philippot, éminence not all that grise of the process of dédiabolisation (detoxification of the party image) last autumn and embarked on a process of ‘consultation’ of the grass roots, or whatever is left of them. According to Le Canard enchaîné (24 January 2018), membership, and more specifically party subs, have taken a nosedive, which makes the recent ruling that banks should not refuse loans to the FN even more of a relief to the party. Now, that’s not so surprising. I have already commented on the rapid decline in membership numbers for LRM and LFI, as well as the participation rate in the LR presidential elections in December 2017. And it will also be interesting to see how many of the Socialists remaining 100,000 members actually vote in their leadership election this week. The bottom line is that parties always suffer in post-election periods. Still, the palmipède, as Le Canard enchaîné is also known, reported that in some departments the rate of subscription has dropped by 20-30%, while in Moselle, in the east of France, it is down 80%. Yes, but who in France uses a mug? Bannon was able to attend because he had come over to Europe to cover the Italian general election on 4 March and to make contact with the leaders of what he describes as an international network of national populist parties. Anyone else get the paradox of an ‘international network of national populist parties’? During the week, he addressed a meeting of the Swiss populist UDC in Zurich and also met the leaders of the German AfD. Bannon’s appearance at Lille was organised through Le Pen’s partner, Louis Aliot and remained a secret up until the eve of the congress. It was also something of a coup for Marine Le Pen, because previously Bannon had focused on her niece, Marion Maréchal Le Pen as the rising star of the French far-right. The latter’s appearance at the CPAC meeting in Washington appeared to signal that she is preparing to come out of her temporary retirement from politics, sensing perhaps that her aunt is running out of steam. Le Pen doesn’t quite look like she’s finished just yet. There were, of course, dissenting and disappointed voices at Lille: it’s not difficult for a journalist to find a congressiste to express their frustration that nothing seems to be changing. But Le Pen was cheered to the rafters whenever she spoke and Bannon went down a (worrying) storm as he told his audience to wear the accusations of being racists and xenophobes as a ‘badge of honour’ and was greeted by chants of 'On est chez nous'. The main events on the Sunday were the election of the party president and executive committee and the adoption of new party statutes. Marine Le Pen was easily re-elected, with no challengers and just 2% of spoilt ballots. The election to the party executive was a little disappointing for her, with some of the old guard getting back on, but the key points are that Nicolas Bay and her new best friend, Sébastien Chenu were re-elected too. And, more importantly, her niece did not stand and so has no formal platform within the party, even if she might be planning a comeback before 2022. The next election of the party president is in three-years’ time and the party statutes specify that the head of the party is its candidate for head of state. Le Pen also had the satisfaction of seeing new party statues ratified, which included the abolition of the role of honorary president, i.e. her father. La cerise sur le gateau, however, was the much-anticipated change of the party name, which had been mooted as early as May last year, after Le Pen’s defeat by Macron and as a means of reaching out to other parties to form an alliance ahead of the general election. Then, one of the suggestions was the Alliance Républicaine et Patriote, but Le Pen lost control of the term ‘patriote’ when Philippot set up his own group within the FN called Les Patriotes and then left to found his own party under that name. Various other options had done the rounds since then, but the lexical field of terms is limited, not just by ideology but also by others having already registered certain terms. Even the ownership of the name Front National was disputed back in the early 1970s and in itself it masked the quite disparate range of microparties that gathered together under the FN umbrella and Jean-Marie Le Pen’s leadership, from hardline Catholic intégristes to the defenders of Algérie Française to the nostalgiques de Vichy and white supremacist groups, or even the rump of French monarchism. Nevertheless, Marine Le Pen had made it clear in the weeks leading up to the congress that, for her, if the FN is to become a party that can enter into strategic alliances with other parties and hope to govern, it has to change its name. She didn’t quite say that the name Front National has become a toxic brand, but that was her subtext. Her choice, the Rassemblement National is not without its problems, perfectly well outlined in this article in The Guardian. In the first place, there are historical echoes of a collaborationist party of the 1940s, the Rassemblement National Populaire. In the second place, it’s been used before – by her father in 1986, not for a party but an electoral alliance that reached beyond the narrow confines of the FN. And in the third, according to a number of sources, the title has already been registered. In itself, the term rassemblement is not problematic. It means assembly, group, union, coming together. Before it morphed into the Front Populaire, the broad left-wing anti-fascist alliance that won the 1936 French general election was known as the Rassemblement Populaire. In more recent times, rassemblement has generally been associated with parties of the Gaullist right. Thus, in 1947 Charles de Gaulle set up the Rassemblement du Peuple Français (RPF) and Jacques Chirac the Rassemblement pour la République (RPR) in 1976. Towards the end of the 1990s, Charles Pasqua, who was active in both the RPF as a young man and in the RPR as its main organisers, quit the RPR over its pro-European stance and set up a Rassemblement pour la France along with fellow Eurosceptic Philippe de Villiers’ Mouvement pour la France and took more seats in the 1999 European elections than the main RPR list, led by Pasqua’s former protégé, Nicolas Sarkozy. Marine Le Pen herself had already used the word before, in the general and intermediate elections between 2012 and 2017, through her Rassemblement bleu Marine, aimed at establishing a bridgehead to right and far-right politicians and voters alienated by the FN brand. Although the announcement of a new name was warmly applauded by the congress, it was in itself something of a disappointment. And of course, historians, journalists and politicians jumped on the announcement straightaway. On the Monday morning following the announcement, Igor Kurek, the president of what remains of Pasqua’s RPF, went on national radio to claim that he had patented the title and was in no mood to let Le Pen have it. As time went on, however, it runed out that Kurek had not actually registered the name and had left it to an associate Frédérick Bigrat (no, honestly, I didn’t make that up), whose name appears on the registration and who is, in fact, happy to turn the name over to Le Pen. Meanwhile the revival of the name Rassemblement National has been exercised a number of French historians, including the excellent, but by his own admission macroniste Jean Garrigues, given its echoes of Vichy and the execrable Marcel Déat. Rather than just a collaborator, Déat was a collaborationist who believed that France should not just put up with German occupation, but fully throw itself into become a fascist state. Le Pen has left the adoption of the name open to a poll of the membership, to be decided over 'the coming weeks'. But the question is, will a new Rassemblement National appeal to or be able to reach out to other parties on the right? Nicolas Dupont-Aignan, leader of Debout la France, seems willing to open talks, as do the historic but tiny Centre National des Indépendants et Paysans. But the real target is an alliance with Laurent Wauquiez and Les Républicains (LR). The tentation frontiste is one that has exercised the republican right in France for more than thirty years, but under leaders like Chirac and Philippe Séguin, and even Pasqua the line was clear. No collaboration with the FN. Sarkozy was less forthright, but preferred to combat the threat to his right flank by using the rhetoric of the far-right against it. His success at the 2007 presidential election was built, in part at least, on bringing a large part of the electorate that had voted for Jean-Marie Le Pen in 2002 back into the republican fold. By 2012, however, his failure to deliver on promises of immigration choisie and maîtrisée go a long way to explaining the success of Marine Le Pen. At the 2015 regional elections, Sarkozy refused to back Socialist lists better placed than LR ones in run-off elections against the FN, a position that drove a deep wedge between him and Christian Estrosi. And I have outlined in previous blog posts that while Fillon called for his voters to rally to Macron as soon as he knew he had been eliminated from the presidential race on 23 April 2017, Wauquiez’s position was that a vote against Le Pen was not a vote for Macron. Today, there are plenty of voices on the right of LR who think an electoral alliance with the FN/RN is acceptable or even desirable. The latest of these is one Thierry Mariani, a junior minister under Sarkozy and Fillon. On the eve of the FN congrès de refondation, but in an interview not published until the Sunday in the Journal de dimanche, Mariani, who represented his native Vaucluse in the National Assembly from 1993 to 2010 before becoming transport minister, said that the FN/RN had changed, and that the time has come for the right to abandon its centrist allies and talk to the far-right. You would be forgiven if you’ve never heard of Mariani. He’s not exactly a household name even in households where these things matter, but his provenance is revealing. Born in Orange, in the Vaucluse, in 1958, he was mayor of the nearby town of Valréas from 1988 to 1995. Elected deputy for department’s fourth constituency (Orange and its environs) in the right-wing landslide in 1993, he held his seat until 2010, when Sarkozy made him a minister (in France, as in the US, you cannot sit in government and parliament). He was also a regional councillor for Provence-Alpes-Côte d’Azur (PACA) from 2004 until 2015. The Vaucluse is one of the southern heartlands of traditional FN support, built on a strong pieds-noirs presence and throughout his career Mariani has faced the challenge represented by Jacques Bompard, a former member of the far-right wing movement Occident and a founder of the FN in 1972 with Le Pen père. Bompard gained national prominence when he was one of three FN mayors elected in the 1995 municipales, for Orange, a position he still occupies today. Bompard left the FN in 2005, out of frustration at Le Pen’s authoritarian style and, above all, his refusal to take local politics, the bedrock of the French system, seriously. After joining Villiers’ Mouvement pour la France, Bompard left after the MPF fell within the orbit of Sarkozy’s UMP. With regional elections looming in March 2010, Bompard set up his own Ligue du Sud, an alliance of small far-right groups, including the particularly charmless Bloc Identitaire, whose use of the wild boar as a symbol, linking them back to their ancestors the Gauls tells you all you need to know. In those elections, Bompard lined up against an FN list headed by Jean-Marie Le Pen, a Socialist one led by Michelle Vauzelle, president of the regional assembly since 1998 and… Mariani, heading a majorité présidentielle list. Bompard was eliminated, with less than 3% of the vote and Le Pen, Vauzelle and Mariani went forward into the second round. But it was noticeable throughout the campaign that Mariani focussed entirely on the shortcomings of the ruling left-wing regional administration under Vauzelle and made very few attacks on Le Pen. Vauzelle won and his list’s 44% of the vote in the run-off gave them 72 seats to Mariani with 30 (from 33%) and 21 for the FN (23%). [French regional elections give the winning list half the seats. The remaining half is then allocated proportionally.] There was a sense of relief at UMP headquarters that the right would not have to face the embarrassing situation of an offer from the FN to form a coalition, not least because Mariani was difficult to handle. In the summer of 2010, Mariani was one of a group of thirty or so deputies who rebelled against what they saw as government backsliding over immigration and security by setting up La Droite populaire, a group of right-wing frondeurs within the UMP. There also appears to have been an issue of a personal offence on the part of Mariani, who felt that he should have been appointed to a ministry already. In fact, the nomination came in the autumn, but the group remained and Mariani was a forthright supporter of the droitisation of Sarkozy’s second round campaign in 2012. Since the announcement of the plan to change the name from Front to Rassemblement National, the response from within Les Républicains, Mariani apart, has been muted. Wauquiez has been mired in a scandal of his own recently, after giving a series of lectures at a Lyon school of government where he imagined no-one would record the proceedings and where he slagged off various political figures whilst adopting a very clear identitaire posture. Wauquiez claimed that his provocative and populist approach was no worse than that of a young Jacques Chirac, evoking a time when the former president was known as ‘le bulldozer’. That claim in turn earned him a rebuke from former PM Jean-Pierre Raffarin that reminded me of Lloyd Bentsen’s comment to Dan Quayle during the 1988 vice-presidential debate, when Quayle compared himself to JFK: ‘Senator, you’re no Jack Kennedy’. Elsewhere, there is a feeling that Marine Le Pen has played her trump card (no pun intended) and that it has fallen flat, though that comes from Le Figaro, the LR’s daily newspaper, so it might be wishful thinking. In early February 2017, Emmanuel Macron officially launched the campaign that led to his election as President of the Republic in Lyon. Last Saturday (18 November 2017), his party, La République en Marche (LRM), were back in town (or nearby at a conference centre in Chassieu) to formally adopt the party delegate-general and elect the bureau exécutif. I wrote in my last blog entry about Macron’s choice of Christophe Castaner to lead les marcheurs and offered an explanation as to why he, rather than Benjamin Griveaux is considered a better man for the job. The choice, or perhaps more precisely, the way in which it was arrived at, has not been unanimously welcomed, however, by marcheurs, and last week a group of about 100 local organisers and party members announced they were leaving LRM because it had become a ‘top-down’ party with little evidence of democratic consultation of the membership – whoever they are. (I’ll come back to that in a minute.) Macron appointment of Castaner as his loyal lieutenant i/c the party appeared to them to confirm that LRM is in fact just another party like the others. In Saturday’s Le Monde, Marc Lazar, professor at Sciences-Po in Paris, underlined the problems confronting Macron and the LRM in clarifying the role of the party and reconciling what he terms the necessary organisational verticalité and with the horizontalité promised to the grassroots. In Macron’s defence, on paper at least, LRM remains a fluid structure at the local level (see this blog entry), but the practice may be playing out in a different way to what members expected. That said, while the right-wing Le Figaro had delighted in les marcheurs’ discomfort, Le Monde presents a rather more nuanced picture of disgruntlement and disaffiliation here, set-off against enthusiasm and lively debate there. It’s a fragmented field. Put briefly, the leaders and members of a new political party are still trying to work out what it all means. What did anyone expect? So, Castaner has his work cut out, defining his own role and relationship with the President of the Republic, with the executive, with the departmental organisers (référants) and the grassroots membership and their aspirations to influence policy. Is LRM simply an electoral machine or is it a cohesive and coherent party? And it’s worth noting that other political formations – Mélenchon’s La France Insoumise and Benoît Hamon’s M1717 – face similar questions about the role and direction of a political movement based, initially at least, around a presidential candidate. These and other questions prompted Le Monde’s ‘Les décodeurs’ to look at the question of just how many members does LRM, or any of the other French parties, actually have? The answer is elusive. On Monday 20 November, Laure Bergé, LRM deputy for the Yvelines and party spokesperson in the National Assembly, claimed that the party still has 380,000 members. But this figure is not based on firm data, so much as signing up to the party’s website. And given that the party can offer free membership, the sky would seem to be the limit. More cautious voices within LRM suggest a ballpark of 100-150,000, while only 71,000 formally approved the party statutes in August. Is La France Insoumise really the biggest party in France? It seems unlikely. The figure of 540,000 is based (again) on free clicks on the LFI website. And among the more established parties, there is also a gap between the numbers of members they claim and the card-carrying ones at a given census point. So, you can make of the figures what you want. We will have a better idea of the number of active members of Les Républicains come December’s leadership contest, but over last weekend (18/19 November), the LR candidate at this year’s presidential election, François Fillon, confirmed his long-anticipated withdrawal from politics, a year to the day after his extraordinary triumph in the 2016 right-wing primary. Fillon’s announcement took place at a meeting of Force Républicaine, the loyalist micro-parti he founded in 2002. Fillon handed over the baton to Bruno Retailleau. Senator for the Vendée, where Fillon’s social conservativism and identity politics go down a storm, Retailleau is the chair of the LR group in the upper house and stood by the candidate throughout the worst moments of the presidential campaign, but it remains to be seen whether Force Républicaine will survive the retirement of its founder. In handing the group on and without wading directly into the leadership campaign, Fillon made it clear that he believes that the political landscape cannot be left to Macron and the extremes (meaning LFI and the Front National), but that there needs to be a republican voice standing up for French identity. It is not entirely clear if Fillon means by this a vote for Laurent Wauquiez. Florence Portelli is a filloniste, whereas Wauquiez was one of Sarkozy’s protégés. For his part, Retailleau has echoed Fillon’s position, but again, without firmly committing himself to one candidate or another vote too. All of which is good news for the LR leadership frontrunner Wauquiez and comes in response by two other heavyweights, Alain Juppé and Nicolas Sarkozy, weighing into the debate. Sarkozy, Wauquiez’s political mentor expressed his concern that he needs to work harder to present himself as a future leader able to reunite - rassembler - a political family bitterly divided by the presidential campaign and by Macron’s victory. For his part, Juppé has made no secret of his admiration for the way Macron has conducted himself since his election. And on the left of the party, the macroncompatibles expelled from LR have announced the creation of a new party, Agir. Literally this translations as Act, but I quite like ‘Do something’. Wauquiez’s campaign so far has been about anything but an attempt to ‘rassembler’ Les Républicains. Like his mentor in his 2007 presidential campaign and in the 2012 second round contest, Wauquiez has opted for a very clear droitisation around the issues of immigration and French identity. Either he has decided that the soft centre of his own party and the Union des Démocrates et Indépendants (UDI) are beyond redemption, or he is trying to steal the FN’s thunder. Probably both. Until last weekend, his campaign had received very little attention at all from Marine Le Pen, who, when asked if she would seek to make any kind of electoral alliance come the 2019 European elections or for 2020’s municipals, simply refused to be drawn. That she changed her tune on RTL’s flagship politics programme on Le Grand Jury on Sunday might well suggest that Le Pen is uneasy about Wauquiez winning a large majority in the election and camping on her ground. Above all, Le Pen floated the possibility of an LR-FN electoral alliance, which is also a tatctic to destabilise him and his reputation among the LR membership. Wauquiez has replied that, if elected, he’ll have nothing to do with her. We’ll see. In other electoral news, this week, President Macron received all of the party leaders, one-by-one, at the Elysée this week to sound them out about a return, for the 2019 européennes to a national ballot. European electoral law allows each country to carry out the election of MEPs as it sees fit. In 2003, Jacques Chirac and and his PM, Jean-Pierre Raffarin and interior minister Sarkozy changed the system in France from a national ballot to a series of regions, in a deliberate attempt to limit any gains the left might make in the 2004 election. Macron favours a return to a national election, but not all the parties are in agreement. The président jupitérien names his man to lead La République en Marche. The other parties shuffle the pack. A couple of weeks ago, I wrote a series of three pieces about the Senate renouvellement of 24 September 2017 that underlined the failure of the presidential party, La République en Marche (LRM), to make any inroads into the French upper house. In the second, I showed the camembert from Le Monde showing their best guess of how the numbers would play out in terms of Senate groups. We now have the final scores, as it were, this time courtesy of the excellent Public Sénat. 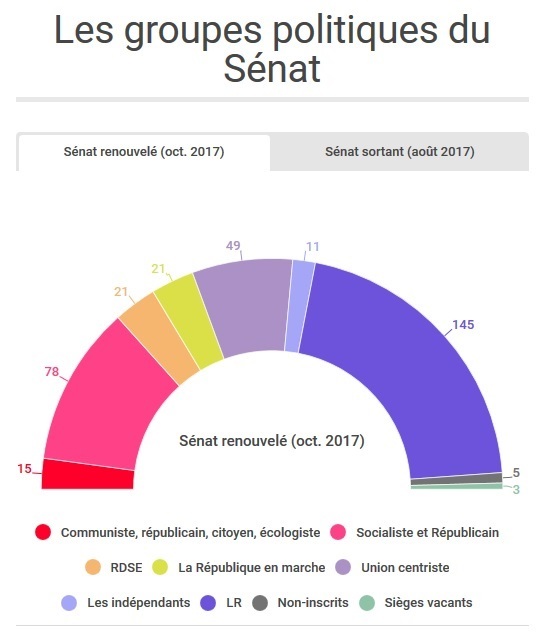 It’s worth briefly making a comparison and offering a comment on how the groups have worked out, especially with the distribution of the divers droite categories of non-aligned right-wing senators, of whom Le Monde identified 33. Now, at the time, we thought that perhaps as many 15 of these would join the majority Les Républicains group. This has not, in fact, happened. Instead, about 13 divers droite senators have joined the centre-right UDI group (known as the Union centriste). Sandwiched between them, on the organigramme at least, is a small group of 11 right-wing senators who have formed a group called République et Territoires/Les Indépendants. In a sense, this is a reflection of what happened earlier this year in the National Assembly, with a small number of LR deputies forming a group of centre-right macroncompatibles deputies under the label of Les Constructifs. The group calls itself ‘liberal, European and social’ committed neither to outright opposition to the government nor to blindly following. The group is dedicated to protecting the interests of local government and administration (aren’t they all?) but also, within the framework of the refondation of the right currently underway, committed to resisting the identitarian drift – la dérive identitaire – that some foresee if Laurent Wauquiez is elected leader of the LR. Whether Les Indépendants are outriders for a bigger rift within LR, come December’s leadership election, whether they will be absorbed back into the main group or into the UC, or maintain their separate space remains to be seen, of course. Meanwhile, on the left, the Socialist group has absorbed most of the Radicaux de Gauche and become the Groupe Socialiste et Républicain. The LRM group has just 21 members, as does the RDSE (a gain of five seats). On the far-left, the Communist-led CRCE group has grown to 15. The ecologists elected in the upper house are spread across the left-wing groups. The three vacant seats are for senators who have either resigned because of the new law on the accumulation of elected offices (François Baroin and Henri de Raincourt*) or have retired from politics (former PM Jean-Pierre Raffarin). All three were LR senators and the group should take all three seats, in the Aube, Yonne and Vienne departments. The by-elections are scheduled for December. *Raincourt , who supported François Fillon during the right-wing primary, is also currently investigation for alleged misuse of public funds. The investigation is suspended at present. Edouard Philippe doesn't quite stun the nation and the Macron presidency shows a sense of dignity. Macron address both houses, meeting at Versailles as le congrès, amidst accusations of becoming a président monarchique. We came expecting Clausewitz. And got the Comtesse de Ségur. The collapse of the far right and radical left votes in France since 23 April has been nothing less than spectacular. And who doesn't love a map? As fewer than half the French electorate turn out to vote, voices are raised calling for PR. And the government is listening.